Welcome home to 695 Harper Drive. 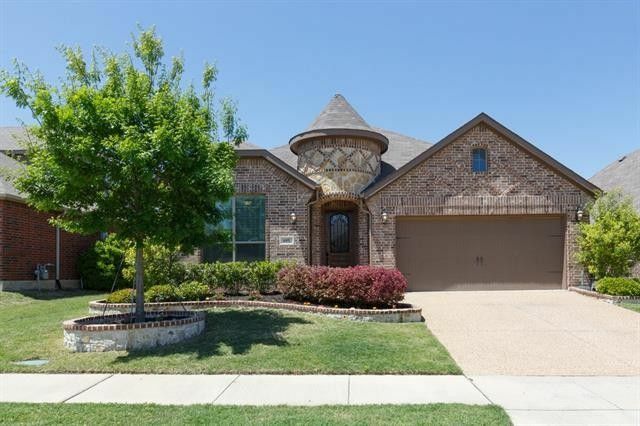 This gorgeous home has amazing curb appeal and is located on the Rockwall ISD side of the highly desirable Master Planned community of Woodcreek. The architectural elegance of the home is apparent the moment you enter the Foyer which showcases a double tray ceiling with crown molding, art niche and ceramic tile flooring with decorative mosaic accents. The handsome Study boasts French doors for privacy and a coffered ceiling with crown molding. The gourmet Kitchen offers an abundance of richly stained Knotty Alder cabinets, thick granite counters, tumbled stone back splash with metal accents, stainless steel appliances including a 4-burner gas range and walk-in pantry. The large island offers breakfast bar seating with pendant lighting. The open Dining Room is perfect for everyday family life and entertaining. The warm and inviting Family Room features a cast stone fireplace with gas logs, laminate hardwood flooring and crown molding. The Master Suite is split for privacy and offers a tray ceiling with crown molding and cozy window seat. Its luxurious bath includes separate furniture-style vanities with marble tops, framed mirrors, oil rubbed bronze fixtures, jetted tub, oversized tiled shower and spacious walk-in closet with seasonal hanging rods. The secondary bedrooms share a nicely appointed bath with dual sinks. The Laundry Room has convenient upper storage cabinets and open shelving. Exterior amenities include stone/brick landscape borders, covered back patio, sprinkler system, gutters, raised planter beds and garage door opener. Woodcreek offers a community clubhouse with a fitness center, pool, splash park, dog park, multiple playgrounds, bike/hike trails, sport fields, stocked pond and 2 onsite elementary schools. The neighborhood has easy access to SH-66 and I-30 for your commute. Directions: I-30, North on John King Blvd, Right on Hwy 66, Left on Woodcreek Blvd, Right on CD Boren, Right on Fate Main, Left on Harper, Home on Left. Exclusions: Wall mounted TVs in Family and Bed 2.